The Civil War made it particularly important that the ceremonial functions of the administration appear dignified and competent. This public image helped calm domestic critics and reassure foreign governments, especially England and France, which were being courted by the Confederacy. The Lincolns faced the challenge of maintaining proper decorum without appearing self-indulgent when so many were sacrificing so much. Their background made this task even more difficult, as they had to overcome eastern stereotypes of “uncultured” westerners. "The people scrutinize every article that I wear with critical curiosity. The very fact of having grown up in the West, subjects me to more searching observation." 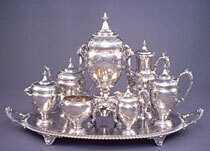 Silver service made by the Gorham Silver Company. Each of the pieces is engraved on one side with the monogram “MTL” and a crest on the other. It is likely the service was presented to the first lady as a gift from the citizens of New York. 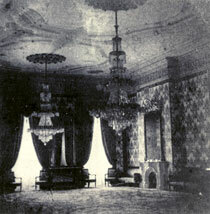 East Room of the White House after Mary installed a new carpet and wallpaper in 1861. Courtesy of the White House. The Executive Mansion needed repairs when the Lincolns moved in. 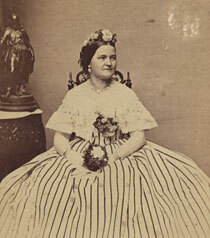 Congress provided every new administration $20,000 for renovations, and Mary Lincoln took charge of the work. But she quickly ran up bills that exceeded the budget. Dealing with this debt became a constant strain on Mary and a source of tension between her and her husband. Mary Lincoln took her role as first lady very seriously. Some newspapers portrayed her as “the republican queen,” elegant and admirable at public occasions. Others criticized her for conspicuous consumption in time of war and sacrifice. Although she came from a genteel Kentucky family, she was the wife of “the railsplitter,” and many people expected her to embarrass the nation with uncouth western manners. 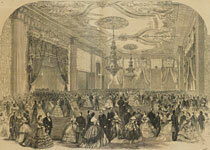 On February 5, 1862, Mary organized a grand evening ball that showcased many of the new renovations to the Executive Mansion. The reception was largely viewed a grand social triumph. Upstairs, however, Willie was resting sick in bed. The doctors had assured the Lincolns that he would be fine, but 15 days later Willie died from typhoid fever. 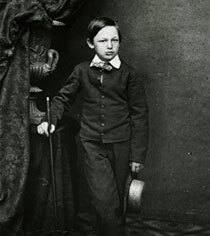 Willie Lincoln died on February 20, 1862, at age 11. The loss deeply affected both parents and cast a solemn shadow over the Lincoln White House.